I’ve heard so much about Barcelona. The architecture. Gaudi. The art. Dali, Picasso, Miro. The sports. FC Barcelona, Messi. The beautiful gardens and wonderful tourist spots. But here we are, at the Mobile World Congress 2013. Our multi-screen version of SpeakingPal English Tutor is in two booths – one at the Qualcomm sponsored “Connected City”, and one at the Sony make.believe space. Why two booths? 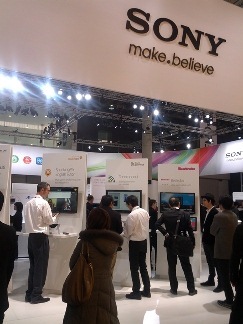 Well, SpeakingPal won first place for Best Multi-Screen Experience in the Qualcomm sponsored AllJoyn Peer-to-Peer App Challenge, and also won a free MWC booth in the Sony Multi-Screen UX Competition. It was all very exciting. Ok, very little sleep, hardly eating, standing on our feet all day. Did I mention that there were loads of people, with a constant stream of visitors? The latest trends. The coolest gadgets. And we were in the thick of all this delightful technology! So, in the end, it was all worth it.